The French playwright and actor Molière (1622-1673) once remarked, “Of all the sounds known to man, opera is the most expensive.” A glance at the budget of the Opéra National de Paris today does little to dispel this perception: annual expenditures exceeding 200 million euros (approximately $225 million), a professional orchestra of 170 players, a chorus of 110 singers, and a ballet corps of 150 singers – to say nothing of the administrators and backstage staff required to support this flagship operation. This is opera in one of its grandest forms. This article is Part 5 of the Daily Planet’s Opera Week coverage, a series of articles about opera in Minnesota leading up to the opening night of The Elixir of Love. Over the course of seven days, our coverage will examine some of the individuals and organizations that write opera, produce it, and perform in it in the North Star State. You can read Part 1, Part 2, Part 3, and Part 4 online. “Large” is difficult for many people to separate from opera, especially with lingering but outdated stereotypes involving fat women in horned helmets, but the genre’s origins are much smaller. The earliest operas were small and compact works, designed for performance in a salon or small theatre, not an expansive space like the Paris Opera’s flagship 2,700-seat Opéra Bastille theatre. Indeed, when the French Revolution abolished government-sanctioned monopolies on performing opera in France, dozens of small opera companies quickly sprang up in and around Paris – many of which performed in taverns, stables, and other improvised spaces. Some of these companies performed scaled-down versions of operatic favorites, while others decided to perform chamber operas—works specifically written for smaller casts, spaces, and orchestras. Some undeniable advantages of performing chamber operas are that they are cheaper and easier to stage than their grand opera counterparts. The dramatic writing is usually economical in terms of scene changes; after all, a tavern room or intimate auditorium has little space for storing extra set pieces and backdrops. They also especially attractive to college opera programs, as they tend to have more principals than chorus roles, are easier to rehearse, and can frequently be staged in black box theaters. These same qualities make the works especially appropriate for music and theater festivals, and chamber opera festivals have sprung up across the United States, England, and Germany. They are also particularly attractive for composers wanting to practice their art—and see it staged – before attempting a full-length opera. College opera programs aside, most of Minnesota’s opera producers have yet to jump on the chamber opera bandwagon. More-established companies, having cultivated an audience of a certain size, perform exclusively or near-exclusively in mid-size-to-larger venues. Since new chamber operas increasingly the majority of new operas written and performed in the United States each year, this presents a growing mismatch between the expanding new repertoire and the age of the traditional canon that most more-established companies prefer. These factors were all under discussion at the annual convention of the National Opera Association earlier this month, where opera directors, coaches, voice teachers, and other affiliates gather to discuss the future and practice of the art form. 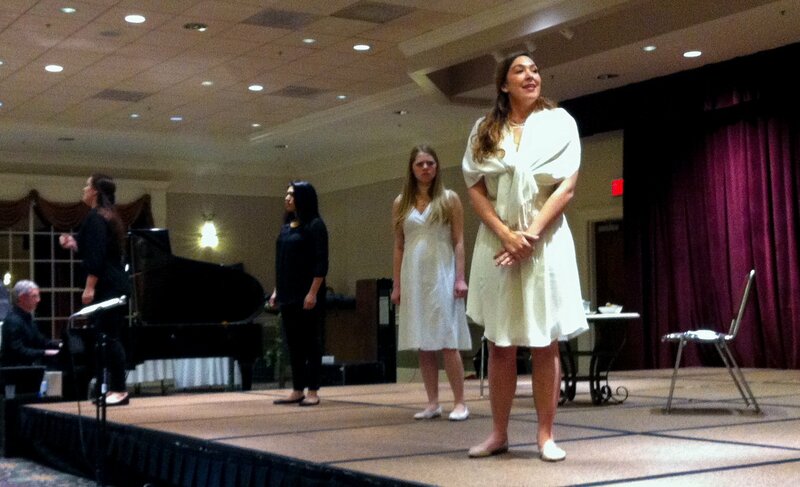 Attendance was especially high at the final round of NOA’s biannual Dominick Argento Chamber Opera Competition, which featured 20-minute, semi-staged excerpts of the three finalists. The winning opera, The Clever Artifice of Harriet and Margaret by composer-librettist Leanna Kirchoff, was written for just four singers—all women—and has minimal staging requirements. In a lecture and discussions afterwards, Kirchoff described how the practical concerns of controlling production costs shaped the opera’s creation. To avoid any licensing or royalty concerns, she sought out source material in the public domain, eventually selecting the 1913 play Overtones by actress-playwright Alice Gerstenberg. This source material, fortuitously, was written with similar constraints in mind, being written for New York City’s (now demolished) Bandbox Theatre – an intimate space then known for experimental theater and evenings of short plays. One of the most talked-about plays of 1916, it contrasted the inner and outer voices of a pair of women who meet for tea, each with a hidden agenda – a pregnant opportunity for musical exposition. One of the advantages of an all-female cast cited by Kirchoff is that it aligns with the mostly female balance of voice students encountered during her music studies. (Kirchoff is a graduate of the University of Denver, received a master’s degree in composition from the University of Minnesota-Twin Cities, studying with Dominick Argento, and is currently a doctoral candidate in music composition at the University of Colorado.) Male singers benefit from the lion’s share of roles in the traditional repertoire and their relative scarcity in voice programs, while a much larger number of women compete for a much smaller pool of roles. Changing this balance, both in pedagogy and professional performance, was a recurrent concern of NOA attendees this year. The Clever Artifice of Harriet and Margaret is a good start on bringing down opera’s soaring costs and correcting its lingering imbalance.